That was the brief given to renowned architect, Herve Marullaz, after Chalet Joux Plane’s owner secured a large plot of mountain land that backed onto a stream and an alpine woodland. From the moment you first arrive, Chalet Joux Plane ‘wows’ you with its contemporary architecture and cutting edge design. Constructed into it’s mountain top location, so it sits at one with its natural surroundings, and complete with a 23-metre indooroutdoor swimming pool running the length of one end of the chalet, it has been dubbed World’s Best New Ski Chalet. And rightly so. One might assume that the owner set out with a clear design vision driven by an unabating drive to raise the architectural bar. In fact, his search for a mountain home started out as a tentative one, and a passing comment about an empty plot of land. The starting point for Chalet Joux Plane was, in a way, a general sense of disappointment. My family and I had always enjoyed our annual ski holidays, both in Morzine and other resorts. We’d loved all aspects of the skiing but found our rented chalets were always a bit of a compromise. The chalets had at best ticked all the standard boxes, but in a very unexciting way. They had never added to the holiday. They were not a destination in their own right. The chalets themselves had never been the choice. When we decided we wanted to buy our own chalet we found ourselves in the same situation. We found a few pre-existing chalets we quite liked but they were, at best, box tickers. Finally, an estate agent asked if we would be interested in buying some land and took us to a plot on the Joux Plane road. The initial plot was unimpressive. It was well located but quite small. I said in passing ‘get me the plot of land next door and we’ll be interested’. Well, they went away and did just that! With the decision to build our own chalet we realised it was our chance to create a chalet that was, in its own right, a destination. Architecturally, Chalet Joux Plane is all down to the expertise and vision of our architect, Herve Marullaz. We knew we wanted the chalet to be modern and contemporary but it still needed to feel like a nice place to stay - luxury and comfort, cool and modern. Other than that we were quite open-minded. We just said to him, “Build us a chalet we will be excited to stay in”. With this brief in mind, Herve looked at the land and his eyes lit up. He realised he was, to a point, being given free reign to create as he saw fit and he just ran with it because the big plot allowed for that. He came up with incredible features, like the indooroutdoor swimming pool, which extends the entire end of the chalet and allows you to swim in and out; the glass atrium that dissects the middle of the chalet creating incredible light throughout; the windows and terraces that allow you to feel like you are truly living with the mountains. In short, he knew what, and how, to build on this space. Either end of the swimming pool is outside, the main section inside, allowing you to swim from one side of the chalet to the other, or if you prefer, just swim indoors. I also love that we have a gym (my wife loves the spa!). The cinema is great. But for me, personally, I’m excited about all our outside spaces – the pool, the deck, the flow of these, allowing us to really enjoying being in the mountains. I have a lot of favourite features and spaces in the chalet. One end of the house is almost entirely made of glass and you can see straight down the valley. That is where the main living area is, with the mezzanine dining area, the bar, the snug library, the ‘party zone’. It’s such a big space, with big balconies for evening drinks. It’s just space, and views, comfortable sofas, open fire, all created to let you truly experience the mountain. Chalet Joux Plane is in such a great location. It’s close to Morzine town but still very quiet and unspoiled. On one side of the chalet you can hear the stream and the woods. It’s really peaceful. The road often forms part of the famous Tour de France route and is a very famous, champion-beating descent. As a keen cyclist, this was appealing. In winter you can essentially ski in from the Morzine side if you do a little bit of off-piste. Town is a few minutes drive or relaxed walk so you can access everything very easily. Although we find it hard to drag ourselves out of the chalet! The pool is also a big thing for me. Initially I was not sure how we could combine a pool with the land and the chalet, but Herve came back with an indooroutdoor design. I have never seen anything like that before. The pool runs along one side of the chalet, enjoying incredible views down the valley. VIRTUAL TOUR Built into its mountain location, moments from the centre of Morzine, Chalet Joux Plane is a chalet built without constraint. This 680m2 luxury ski chalet is set in a private location with stunning views spanning the entire valley. Guests enjoy six en suite bedrooms all with their own private terrace (including one family suite with separate bunk room sleeping up to four children). The architectural design and the chalet facilities are world class and award-worthy, with Chalet Joux Plane recently nominated as Worldâ&#x20AC;&#x2122;s Best New Ski Chalet in the World Ski Awards 2018. It is these unique features that have made Chalet Joux Plane a destination in its own right, one that will have guests returning time and time again. At One With The Mountain The outdoor spaces were of paramount importance to the owner when Chalet Joux Plane was being designed. He wanted to be able to enjoy being in and at one with the mountains at all times. The chalet structure is quite literally built into its mountain location; every bedroom and living space opens out onto private terraces; a large deck with swimming pool and hot tub nestles into the mountain, backing onto an alpine forest and stream. Inside, the enormous living space has one side entirely glazed and opens out onto a deep balcony overlooking the valley. The building itself is dissected by a glass atrium and there are sections of glass flooring ensuring the chalet is filled, in every area, in every space, with natural light. Chalet Joux Plane allows guests a rare moment, to live in, and exist with, the mountain. Swimming Pool & Spa One of the most exciting features of Chalet Joux Plane is the 23 metre indoor-outdoor swimming pool that passes right through the building itself. Located at the glazed far end of the chalet, offering breathtaking views across the mountains, the pool allows guests to swim both inside and out, creating the ‘in-out’ living experience envisioned by the architect. You can keep the pool closed and enjoy a traditional indoor swim jet experience or open it up and swim from inside to out—enjoying the chalet and the mountains all at once. Outside on the decked terrace there is also a sunken hot tub nestled on the edge of the grounds close to an alpine forest and mountain stream. Extreme luxury feels like the correct phrase to describe this swim-spa experience—you can relax and you can indulge while truly being in the mountains at all times. Sleep Chalet Joux Planeâ&#x20AC;&#x2122;s bedrooms were made to delight. Hanging seats and free-standing bathtubs are all carefully positioned for perfect mountain views. Every bedroom opens out onto its own terrace so you can continue to experience the mountain when luxuriating in your private suite. The bathrooms enjoy ceiling rain showers, diffused lighting, and unique features such as slatted doors to allow natural light into the space, or huge 1.5m2 black stone tiles chosen for their delicate rusty hues making the shower feel deliciously warm, intimate, almost protective in its design. The chalet also offers ample sleep options, whatever the makeup of your group. Choose between the master suite, a family suite (which includes a separate 4-bed bunk room) and three further double bedrooms all with super-king size beds and some with the option to set up the rooms as twins. The Living Space The living space in Joux Plane is like no other, a space built without constraint. The lounge area is expansive and the heart of the chalet. Lavish in size it has been intelligently designed to offer guests a variety of individual experiences. Above, you can dine on the floating mezzanine where â&#x20AC;&#x2DC;dining at altitudeâ&#x20AC;&#x2122; takes on new meaning. Below, the main living space has deliciously comfy sofas (in signature grey, with concrete coffee tables) and a central fireplace, where you can relax in front of a roaring open fire. For quiet times retreat to the library snug area and take a beat under Bocci lighting in your Tom Dixon armchair. The far end of the living space is entirely glazed with a raised mezzanine that overlooks the mountains where you can enjoy a signature cocktail while taking in the magnificent views. Perhaps pause for a moment on one of the swing seats, or relax on the large balcony and watch the sun set. This is a space for coming together but at the same time to enjoy your own space. You are in the chalet, but you are never away from the mountain. Unspoken Luxuries If you are looking for a James Bond chalet, then Chalet Joux Plane is for you. The specification list is, of course, almost endless, but it is what’s not said that speaks volumes. Like that feeling when you walk down the 15m tunnel that runs directly from the private double garage into the heart of the chalet; or the carefully designed boot room with pillar-box windows allowing you a glimpse of the mountains at all times. Then there’s the thoughtfully curated collection of art that you pass as you wander into the games room where you can play bar billiards or enjoy a quick game of pool; a cinema awaits for postpiste film nights or that mid-week afternoon off the slopes. On Level 1 you’ll find your own private gym where you can keep up with your regular routine or enjoy yoga or post-skiing stretching. A private Bamford Spa with Bamfordtrained therapists offer organic and botanical massages and treatments. Then there’s the enormous and award-worthy living space and an indoor-outdoor swimming pool where you can swim in the chalet or amongst mountain peaks. 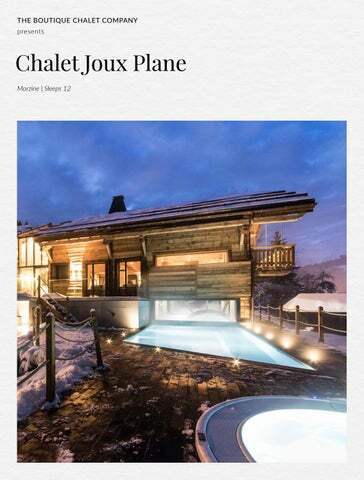 Chalet Joux Plane has been created to offer contemporary cutting edge design but with a sense of whimsy. It is both an experience and a destination. THE DESIGNERâ&#x20AC;&#x2122;S EYE How would you go about creating a world class luxury chalet? First, you would need the perfect location. Then, you would need a visionary architect. Lastly, you would need an interior designer, although lastly does not imply they are an afterthought. A world class interior designer needs the ability to truly see a space. They need to make interior design choices that come to define, not only a space, but every single space within a chalet. They need to be able to do all this effortlessly and with a level of invisibility that makes you accept that a space was always meant to be that way. This task fell to Kyles, of Shep & Kyles, a talented and intuitive interior designer based in the French Alps. Here we get an insight into the interior designerâ&#x20AC;&#x2122;s mind, the creation of greatness and the birth of Chalet Joux Plane. Initial Thoughts Joux Plane is the James Bond chalet. It is the kind of space where Daniel Craig would look completely at home. It is expansive. It is ultra-contemporary. But it still needed to be a space for people to luxuriate. The owner was open minded but there were a few keys features that would determine the direction we would take. For example, the owner doesn’t like shiny finishes, so everything in the chalet is completely matt. Take a look around you now, wherever you read this, and you will notice how many things are created to ‘shine’. Every item brought into Joux Plane was carefully considered, hand picked, and matt. The Palette For Chalet Joux Plane, a very neutral palette was chosen and a very minimal palate was chosen. There are lots of greys used in the space, which work well with the mountain light. We have used glass, greys, old wood, off-blackâ&#x20AC;&#x201D;colours and materials chosen to bring out the natural hues of the wood. The chosen materials and colours are then reused throughout the chalet to create continuity and fluidity. Design Choices: The Wood The wood in the chalet is bespoke and every piece of it follows the architecture of the property. A linear theme runs throughout the chalet, and the placement of every single piece of wood has been carefully planned and placed. The wood always runs along the length of the chalet, with dissecting/dividing panels of wood framing certain sections. Dissecting pieces of wood always run floor-to-ceiling, continuing across the ceiling to the opposite wall, then back down the opposite wall. Continuity, consistency, fluidity. Environmental Factors: Mountain Light Mountain light is very different. In fact, light waves are very specific to all geographic locations and environments. In a city like Miami, there are brightly coloured buildings that â&#x20AC;&#x2DC;popâ&#x20AC;&#x2122; out at you. If you used that colour palette in London it would become diffused. The colours would interact differently with the London light and the colours would no longer work. Another example is the gorgeous lavender shutters you might see somewhere like Provence. They are synonymous with that region. But if you tried to recreate that in the mountains, the mountain light would make those lavender shutters look grey. What we are talking about is light temperature. We are talking about Kelvins. But most importantly we are talking about using colour palettes that work in your geographical location. So this has to be a factor in our design choices. Design Choices: Swing Seats and Bubble Chairs In various spaces throughout the chalet guests can enjoy both swing seats and bubble chairs. Both allow guests to sit and enjoy this incredible space. But they also add a feeling of whimsy to a Bond style chalet that is contemporary and slick. They soften the environment with their whimsical playfulness in a space that could otherwise lean towards the austere. They are the perfect counterbalance to the contemporary that could not be achieved through the use of pattern, fabric and colourâ&#x20AC;&#x201D;those choices would have compromised the larger design choices of the chalet and would create confused and illfitting additions. Simplicity, fluidity and whimsy. Bar and lounge with pool and bar billiards tables, flat screen TV and a wall of wine! The Boutique Experience As part of our Exclusive Collection, Chalet Joux Plane sits amongst some of the finest properties found anywhere in the Alps. To complement the exceptional quality of accommodation you can expect to be looked after by our most experienced professionals who have previously worked in private households, exclusive hotels and Michelin-starred restaurants. Champagne corks pop on your arrival, with a Ruinart Champagne welcome reception and an introduction to your chalet team who include a Chalet Manager, Assistant Manager, Professional Chef, Driver and Housekeeping Team. Following a tour of the fabulous chalet facilities there will be plenty of time to relax and settle into your room. Sumptuous beds, Egyptian cotton linen and indulgent organic and botanical bathroom products from Bamford are our standard. When you emerge, rejuvenated, from your room and head for the dining table, our luxurious catered package is one of the most innovative in the industry. Guests can enjoy our signature dining concepts such as Kaiseki—our Japanese multi-course dining experience—and our critically acclaimed Breakfast Club—the finest way to start any day. Drinks are available from our Four Bottles Bar featuring fine wines, craft beers, select gins and spirits and our own cocktail menu. Each day your driver is available from dawn to dusk to whisk you to and from the ski slopes or the village centre, so there is never a need to walk in ski boots. Our après ski chauffeur service means your comfortable shoes can even be brought to the bottom of the slopes for you! Chalet Joux Plane is available on a fully-catered basis, for exclusive use of the whole property, or during certain weeks on a Boutique Week (room-by-room) basis. Step inside the wellness suite at Chalet Joux Plane and you will discover your very own private Bamford Spa. Our partnership with Bamford is one born out of shared values and beliefs. It’s a collaboration that we are very proud of. Bamford is about the simple pleasure of quality. Since 2006, this philosophy has created the purest body care and spa range using only organic and botanical ingredients. Bamford are committed to making truly natural products using the best artisans from around the world. Bamford is authentic luxury—serene, timeless and pure. Bamford’s organic and botanical facials and body massage treatments are individually crafted and deliver a truly relaxing experience in order to unwind after a day in the mountains. Morzine. The heart of the Portes du Soleil. A beautiful village where skiing has been part of winter life since the lifts first opened in 1934. Whilst traditionally it may not have been a destination for those seeking the finest the luxury ski world can offer, things are changing fast. The village has always been as picturesque as the ski area is diverse, and over the last five years a wave of young independent creatives from across Europe have set up new restaurants, bars and boutiques that wouldn’t look out of place in any major city in the world. This is quite simply a resort on the move. The Morzine ski experience is limitless and should not be underestimated. In part because it forms part of the Portes du Soleil, spanning two countries and 12 different interconnected ski resorts, which is a great deal to ski on any one week ski holiday. But also because each skiing district has its own secret offerings, whether it be quiet slopes during peak weeks for relaxed family skiing or hidden locations that offer powder runs days after the rest of the resort has been tracked. It is easy to forget in the midst of a ski holiday that there are other equally exciting things to experience. In reality, such is the plethora of non-ski activities, they warrant an action-packed week’s holiday of their own. Morzine village offers a wealth of such experiences that happen well away from the slopes. From snowshoeing to hidden restaurants away from the crowds to parapenting with or without skis, there is so much to do here... If you already know Morzine in the winter then it will be yours to rediscover in the summer and your love affair may even fall for the warmer season as summer opens up, not just the mountain, but the entire region. The natural beauty is astounding, as are the gifts the mountain gives you in the form of waves of colourful flowers to marvel at, cool freshwater lakes to swim in and weather to warm your soul. When you’re not out exploring the vast playground that is the Portes du Soleil we know that being back home at Chalet Joux Plane certainly won’t disappoint. 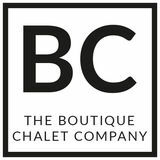 We founded The Boutique Chalet Company in 2011 with a clear vision to redefine mountain luxury and deliver a contemporary version of the traditional luxury chalet holiday. Today that vision is stronger than ever. It’s all that is good about our industry’s history, seamlessly blended with inspiration from exotic destinations and major cities around the world today. you could argue it started with The Breakfast Club, a menu that is a far cry from just bacon and eggs. It showcases a range of signature daily dishes designed by our head chef, Nick Lyon-Dean, and inspired by Brunch Classics—perfect to set you up for a day on the slopes, without weighing you down! Most recently we have introduced our Taste menus. These were created firstly in response to feedback from our guests that they wanted a break from fine dining a few nights of the week—lighter food and faster service—which let them eat as a family or enjoy the wider facilities of the chalets. Then secondly, our desire to showcase further variety in our food, so for example guests might try Lokum, our menu inspired by the piled-high platters of delicious, yet relaxed, Middle-Eastern salads at Ottolenghi; or Pintxo, which takes us back to the bustling tapas bars of San Sebastian. Fantastic spa facilities feature throughout our portfolio, so working with the right spa partner was essential. Enter Bamford. Our partnership runs beyond simply using their luxurious botanic and organic products throughout our properties. We also offer their massage and beauty treatments in our chalets’ very own Bamford Spas. Our therapists train alongside theirs at The Haybarn Spa in the Cotswolds, a statement that only a select few five star hotels can make. considered the best in the industry! World-class properties, curated dining experiences, exceptional levels of service with fine attention to detail and a personal touch throughout. Offering a five-star luxury hotel experience in a private mountain residence. Tying together these elements is of course our service. We’d like to think of it as modern, professional but also relaxed in style. Even small details set the tone here, such as our uniforms which take their inspiration from the bold and ambitious Manchester House restaurant. We want you to feel perfectly at home in your chalet—our team are there when you need them, but not when you don’t—and we try not to do things for the sake of it… tricks aren’t required to make our holidays special. This is Mountain Luxury Redefined. So would you like to join us?